We are absolutely confident that our online tutoring will provide you the help you need. Watch the video below to see how a member logs in, schedules and starts a session. Every Tutorial Channel online math tutor has passed a rigorous selection process and has an advanced degree and specialized training in math. In addition to extensive subject knowledge, our caring and patient tutors are experts in communicating complex math concepts in simple terms. Tutorial Channel tutors take pride in helping students get higher grades, build confidence and increase self-esteem. That is why our results are so outstanding. Educators agree that the best way to prepare for an exam is to take practice and evaluation tests beforehand. Our pre-tests not only help students review the material to gain fluency but also help them conquer the fear and anxiety of taking a written test. This tutoring is really neat. I`ve used it to get night before exam tutoring help. It literally saved my neck! 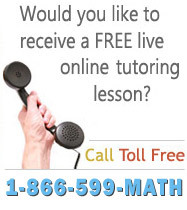 I loved the convenience of your online tutoring. It`s so cool! I can be dressed in pajamas and get tutored. I have used the Tutorial Channel for tutoring my 3 children, elementary and high school. I can schedule lessons easily and the tutors are friendly and professional. It`s been a great help.